Ex-Kota Tinggi MP charged with receiving RM50k | Daily Express Online, Sabah, Malaysia. 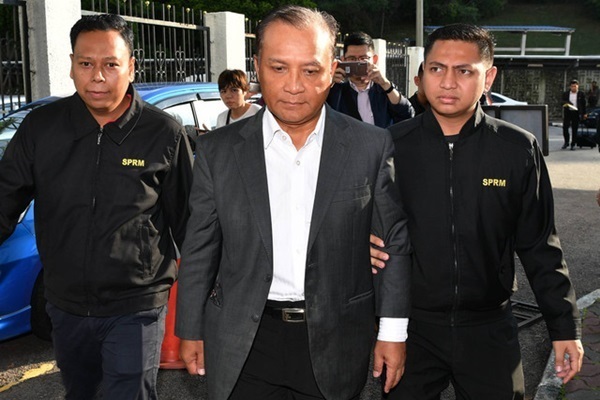 Ex-Kota Tinggi MP Datuk Noor Ehsanuddin Mohd Harun Narrashid was Sunday charged at the Sessions Court here with receiving RM50,000 and a parcel of land as bribes from a printing company in 2013 and 2014. He claimed trial to both charges before judge Kamaruddin Kamsun. ,On the first charge, Noor Ehsanuddin was accused of receiving a cash deposit of RM50,000 from Karya Hidayah Sdn Bhd via his Maybank account on Sept 8, 2013. He is alleged to have committed the offence at the Malayan Banking Bhd branch in Jalan Dato Haji Hassan. Kluang, while he was still a Director of the Federal Land Development Authority ( Felda). As for the second, he is accused of receiving a bribe in the form of land measuring 0.421 hectares worth RM180,000 at Lot 5876, Mukim Kota Tinggi from the same company. According to the charge sheet, he committed this offence on March 23, 2014 at the Kota Tinggi Land Office, Bangunan Sultan Iskandar, Aras 1, Jalan Lombong, Kota Tinggi. The bribes were allegedly for the awarding of a printing project for Felda. He was charged under Section 165 of the Penal Code for both offences and is liable to be jailed up to two years or with fine or with both, if convicted. The court set bail at RM40,000 and fixed March 27 for re-mention. Subscribe to our FREE daily newsletter and get the latest headline in the morning! Get the latest news anywhere... anytime! - on your smartphone.